This week we had lots of messy fun. It began with painting. Bubba was supposed to make "feelings" faces. 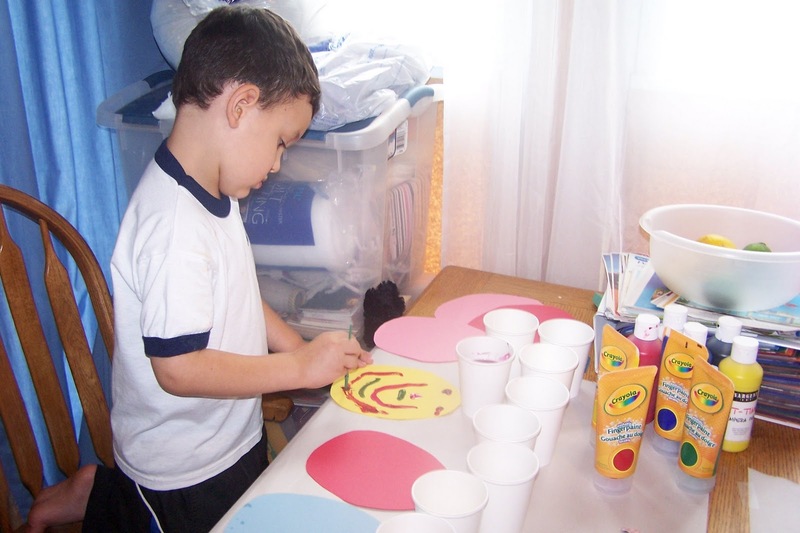 I cut out four circles, one yellow, one blue, one red and one pink. He was supposed to paint the faces showing the feeling each color represents. Princess got in on the action. I drew faces on her circles and let her finger paint on them. It took a little convincing to get her to try it, but once she started, she didn't want to stop. 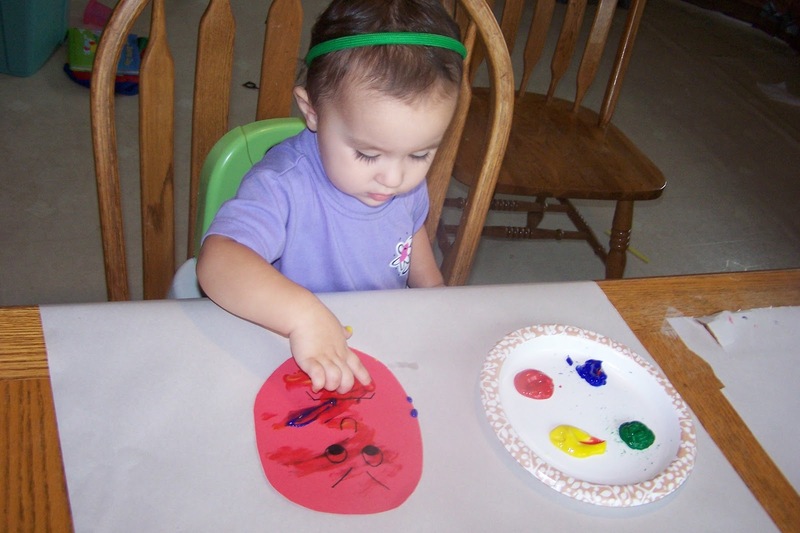 She was still painting long after Bubba lost interest. Later in the week, Bubba practiced writing his spelling words in pudding. To be honest, this wasn't the assignment. He was supposed to make the words with clay. However, he had played with clay the day before and I was afraid he'd lose interest too soon. Princess had a ball playing with pudding too. She obviously wasn't writing words, just having fun playing with the texture and making a mess. 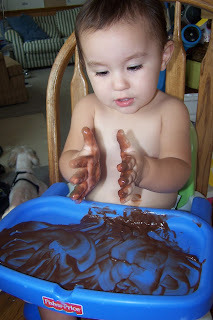 She also dicovered that pudding tastes a lot better than paint! 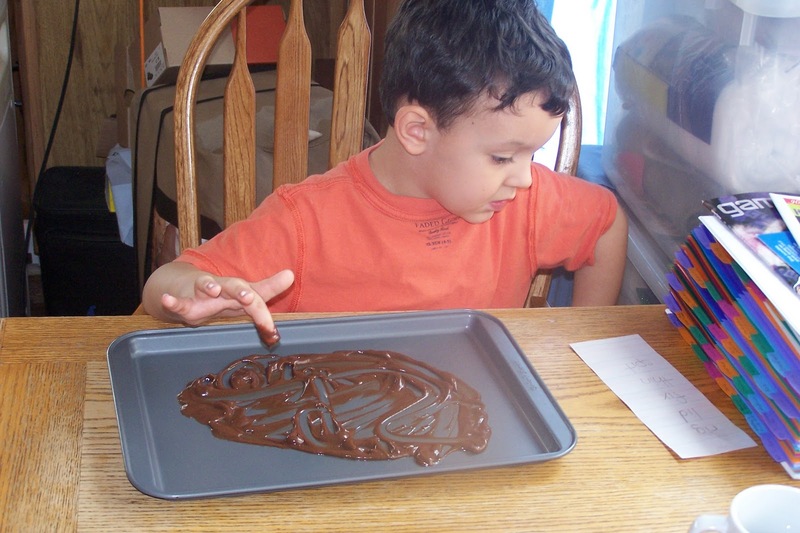 I remember writing in pudding when I was in elementary school and I had so much fun, I wanted to pass on that memory. It was a hit! This is definitely something we will be doing again. 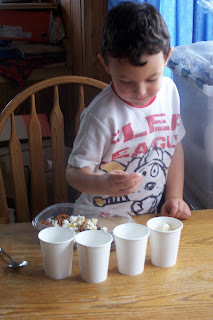 Today's science lesson was about mixtures. 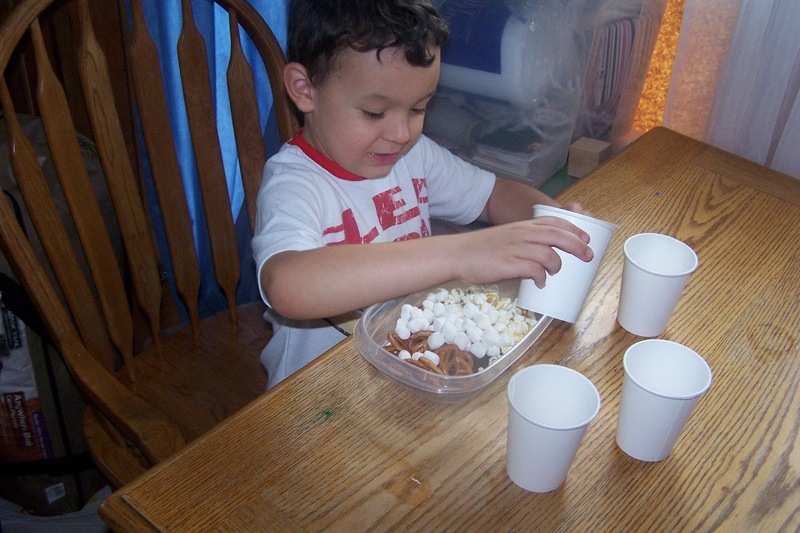 A mixture is a combination of several ingredients that can be separated into their original substances. Wow! That is really technical for a first grader. This is what we did to break it down for our experiment. We started with our fruit bowl. (Which is rather empty since it is the day before grocery shopping.) 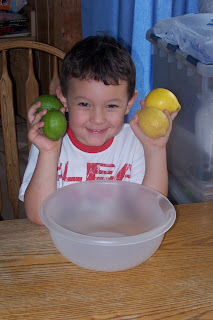 We observed how the lemons and limes were mixed together. Then Bubba separated them into their original groups. 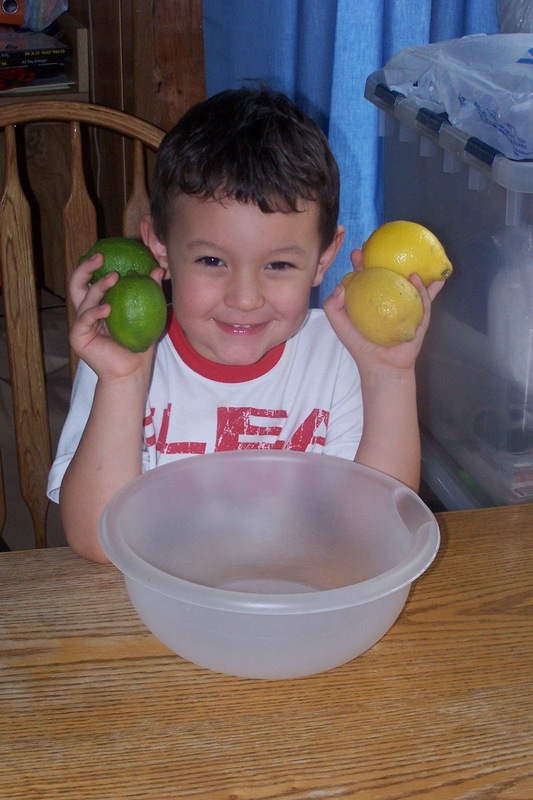 Two lemons and two limes. 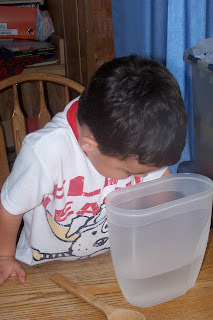 Next we took some sugar and put it into the bottom of a pitcher and I added some hot water. Bubba watched as I mixed it all together until the sugar was dissolved. We observed that the sugar could not be removed from the water. Therefore it was not a mixture. Next, I gave Bubba a cup of popcorn, mini marshmallows, pretzels and raisins. He poured them all into a bowl and stirred them together. We observed that it was a mixture because we could separate it into it's original parts. Which Bubba then proceeded to do. We are a one car family. Once a week I drive Bruischi to work so I can have the car to run some errands. This past week I had a FANTASTIC idea! I took most of Bubba's morning activities with us for him to do in the car. Okay, I admit it is not a new concept for any school at home family, but it was a first for me. I have taken his school work with us on vacations and when visiting family, but never for the drive to and from Bruischi's work. GENIUS! That is almost two hours in the car that is usually "wasted" time. Add to it that I have to run my errands and leave in time to pick Bruischi up, the day usually turned into a non school day. Thanks to that little light bulb, now Bubba can get some work done in the car, do his computer work while Princess takes her nap, and get his workbook pages done while we are driving from place to place doing errands! I am so excited! And, because she has such an early sence of fairness, since Bubba was "coloring" Princess had to color too! Yesterday was rough! Princess was sick on Sunday and still wasn't herself yesterday. She refused to nap and every time I tried to put her down she would scream. Therefore school for Bubba took a lot longer than usual. We normally begin the day about 9. Bubba will do his "Getting Started" activities while I play with Princess. 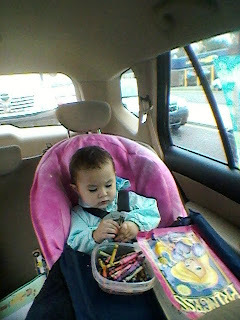 By 10, she is ready for her nap and Bubba is ready for me to help him sign in to the school. Yesterday, because Princess was so cranky and moody, I was not able to give Bubba my undivided attention. He did his best. He listened to all his "Adventures in Midlandia" and watched all his video teachers, but he could not get the workbook pages done with all the commotion with Princess. We took lots of breaks and finally decided to wait for Bruischi to come home to finish his workbook. Ahhh, that was a weight off of both of us. Bubba was excited that he could take a very long break and I could focus on Crankasaurus Rex (AKA Princess). Poor Bruischii didn't know what he was coming home to. Today is much better. Princess is almost back to normal. She went down for her nap with very little fighting. Bubba did all his "Getting Started" activities quickly and with out arguing. Now he is on to his computer work. A little about us first. I am a 30 something stay at home mommy of two, Bubba (5) and Princess (1). Bruischi works a 8-5 job about an hour from home. Bubba is 5, soon to be 6 and is in first grade. 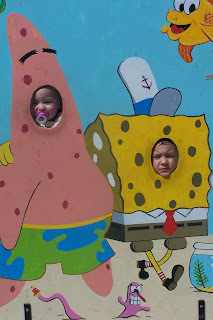 Princess is almost two and is a typical toddler in the "terrible twos" stage of life. When telling people that we cyber school I get one of three responses. The first, and most common, is "What is that?" The second is a look of "You're nuts." The third, and most infrequent, is "That's great!" Sometimes I feel I need to defend our choice and explain why we chose cyber school. Most of the time people are interested, sometimes their eyes glaze over from lack of interest and sometimes they still look at me like I'm nuts. We chose cyber schooling for multiple reasons. My husband and I had very different schooling growing up. I went to a private school from first through eighth grade and then to public high school. While I immensely enjoyed my schooling, the christian values taught to me at school were not the same as those taught to me at home which left me confused. Bruski went to public school for his entire education. He was diagnosed with ADHD and was labeled a troublemaker. He never shook that label and his education suffered for it. We knew we didn't want to send our kids to public school and private school (religious or secular) was financially out of the question. So, if public and private school were out of the question, what about homeschool? 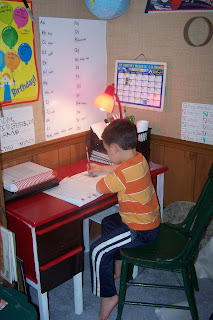 I tried homeschooling Bubba for preschool but found that I could not stay motivated. I would do really well in September and October but by November and December I'd be skipping days to do other things and by January we'd rarely get any school done at all. The cycle repeated every year. I knew I needed some form of external motivation to homeschool properly and I couldn't find one. Also, financially we could not afford to buy our own curriculum and teaching supplies. This lead our search to cyber school. I was amazed when I started to do some research! Cyber school is technically public school. My tax dollars gets diverted from my school district and gets sent to my cyber school. (All this is done by the school district.) All work, while being done at home and supervised by me, is also supervised by a teacher at the school. 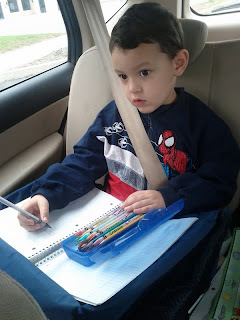 A few times a week we need to scan and submit a workbook page or two to Bubba's teacher. Being a public school, the school is responsible for the curriculum, the teaching supplies and anything else we may need. 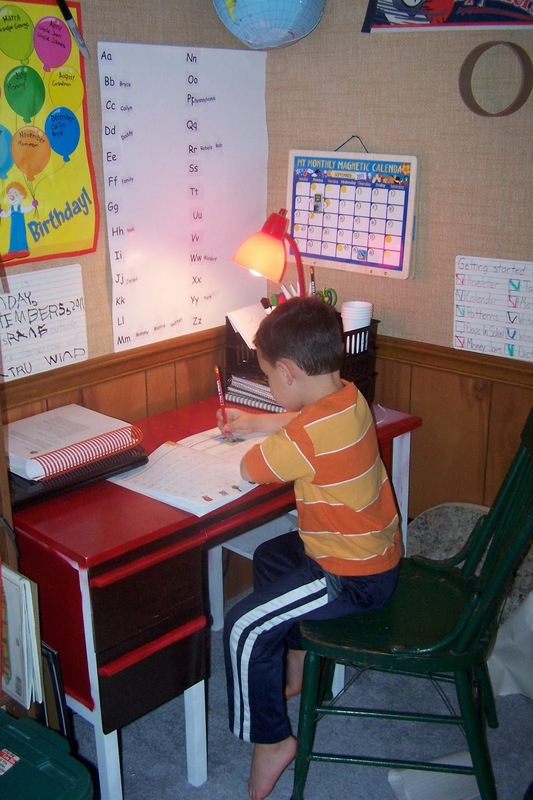 They provide workbooks, reading books and teacher's guides. They supply the computer, printer and internet service (Yes, they pay for my internet!) Also, my school provides pencils, crayons, scissors, paper, even tissues! I'm saving money just by cyber schooling by not having to go to the store with those back to school lists every school sends home! I was sold! Add to that, last year when I was looking to start Bubba in school he was not yet 5. The cut off in our school district is September 1, no exceptions. They would not allow him to enter Kindergarten even though he was already starting to read. If we wanted him to go to school we had to send him to a private preschool. My district does not have public preschool or a K4 program. My cyber school allowed him to enter K4. It is a self paced program and he finished K4 in one month! He started Kindergarten two months before his 5th birthday. This year he is in 1st grade and loving it!